What does it mean to be a smart city? That depends on who you talk to and which city you’re in. Most would agree, however, that being a smart city means using technology to transform how we live and work — to lessen our environmental footprint, minimize financial risks, and even save lives during a natural disaster. In North Carolina, it means helping residents predict storms and identify flood hazards. In Kansas City, it means helping firefighters stay safe with an app that creates a real-time virtual 3D environment before they enter a fire area. And in San Diego, the sky’s the limit. Smart technology strives to connect every layer of communities and their residents, from streetlights and underground infrastructure to rideshare programs and social engagement—particularly in cities. The International Data Corporation reports that worldwide smart city technology spending reached $80 billion in 2018. This number is projected to rise to $135 billion by 2021. With 60 percent of the world’s population predicted to reside within cities by the year 2050, San Diego — the fifth largest county in the U.S. — has the opportunity to be an example around the world of a smart region connected by its smart cities. The city of San Diego’s efforts to become a smart city have already been noticed across the globe. San Diego’s leaders of the Smart Cities Initiative were recently featured on “CBS This Morning” showing San Diego’s progress putting LED light bulbs in streetlights to save $2.4 million annually in energy costs, and also installing sensors to monitor climate and traffic conditions. While city officials and major employers are collaborating on this initiative, small and medium-sized businesses and individual citizens can also contribute to smart city development across our whole region, primarily through the “Internet of Things” — the interconnection of the internet into everyday objects to send and receive data. Business opportunities abound in this environment. Global spending on the Internet of Things is predicted to reach nearly $1.4 trillion in 2021. High-definition cameras, door locks, light switches, thermostats, doorbells and more can be controlled by a tablet or smartphone and a robust internet connection. Nearly half of all Americans already use digital voice assistants on smartphones or devices like Amazon Echo, using voice commands to implement tasks and stay connected. Smart home technology such as telehealth systems will also become a vital tool for households with aging adults and those with physical or cognitive disabilities. This is why Cox Communications collaborates with schools, nonprofits, businesses and local government to connect underserved families with technology through initiatives such as Connect2Compete, a program that provides broadband access and fully-supported, refurbished desktops, laptops and tablets to qualifying families. Our youth are growing up as digital natives, yet the digital divide is still a real challenge for some in our community. Nearly 1 in 5 teens can’t consistently finish their homework, and lack adequate digital knowledge, because they do not have a computer or an internet connection in the home — a cornerstone of a smart city. Becoming a smart region means re-imagining the “digital DNA” of our communities and adopting smart technologies that improve business interactions, community engagement and our personal lives. Over the past 10 years, Cox has invested $15 billion in its network infrastructure across the country and is planning to invest an additional $10 billion over the next five years. That infrastructure will power the smart homes, smart businesses and smart cities of the future and, with the launch of Cox2M connected asset services, there are endless possibilities to build custom applications that connect everything from trash cans to powerlines. When a region embraces technology, invests in its communities, and supports the creativity of its entrepreneurs to develop and deploy these technologies, it will be regarded as a world-class hub of smart cities, and San Diego County is already helping to lead the way and transform how we live and work. 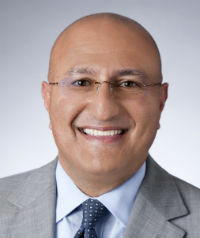 Sam Attisha is the senior vice president and region manager in San Diego for Cox Communications, a privately-held technology company.